The next big thing is here. The Galaxy S7 arrived and so far looks like a vastly improved successor to the Galaxy S6, which was an excellent device on its own. Improving on all fronts, the S7 certainly shows that Samsung has kept an ear close to the ground and taken most of the public's criticism towards the S6 close to heart. So far, we are certainly liking the S7, and we are certain that it will hardly disappoint. Now, one of the things that sets the S7 apart from the S6 are the dimensions. The Galaxy S6 is a pretty compact phone with a formidable screen-to-body ratio, but the S7 is not that compact. Well, the differences are pretty small, but they're here: the S7 is shorter, narrower, but thicker and heavier. Here's how the S7 fares against the S6 and some other notable phones. Honestly I liked the design of the s6 better but then again it doesn't matter to me much as the s7 bests the s6 in everything else..
Waterproofing always messes with the design but like you said the S7 is better in every other aspect compared to the S6. Not in IR! How do I turn off TVs at malls now?? Bruh, I turned off my the overhead projector in class one time it was so funny, the professor thought it was messed up. Everyone sitting on my row were dead lol. OMG Samsung you're a savage, to increasing the thickness so much for a bigger battery, is godly. I didn't think any oem would do that. I'll wait until you see herehttps://dbrand.com/shop/lg-g4 option to change the G5. 7.9mm is thick? We definitely come a long way with our standards, first iphone was 11mm and considered thin. Holy s**t, S7 is 1 mm shorter and narrower than S6 despite adding Waterproofing. That's nothing short of impressive. At the same time, LG G5 is 2 mm taller than G4 while actually reducing the screen size, and not adding much to the hardware, and you guys still calling G5 a better device than S7? it adds 400 mah battery, so I would take that 1.1 mm thickness any day over a thin phone with smaller battery. Yeah! I wish more OEM's did that. I had an Ascend P6 before. Aesthetically great, ergonomically, no. Also it had a terrible battery life + heat issues. "The Galaxy S6 is a pretty compact phone with a formidable screen-to-body ratio, but the S7 is not that compact. 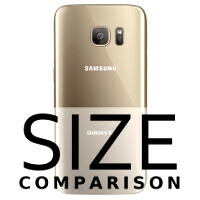 Well, the differences are pretty small, but they're here: the S7 is shorter, narrower, but thicker and heavier." Huh? First of all, the S6 is not compact by any standards, subjective it otherwise, it was a giant flagship phone when launched, and only when compared to phablets would you call it small. Particularly that's laughable if you think about how just a few years ago ask phones where smaller, compact and (bias now...) Actually a reasonable size. Now they're all to big. Then you say, "the S7 is not that compact" - it is that compact. You say the S6 is compact, then say the S7 is not compact, immediately followed by dimensions that are (except fit thickness) smaller. Another "wha?"